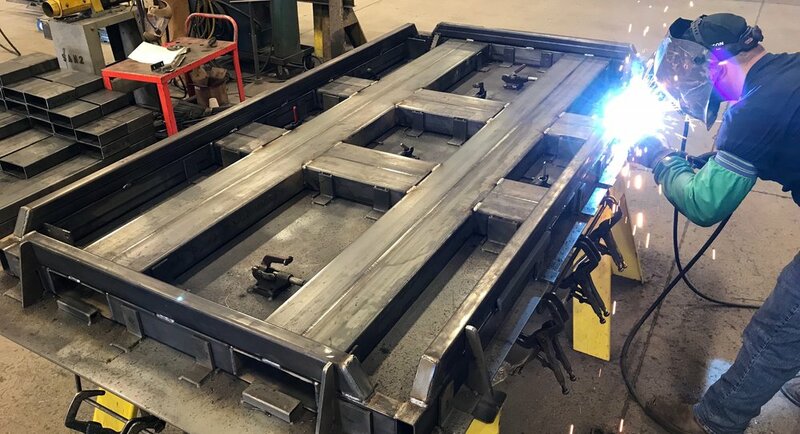 Rivers Metal Products collaborates with Peregrine, Inc. to create these trailers by providing metal fabrication services including cutting, forming, and welding various trailer parts. The two main trailers developed are the Quad-Steer TRACKER™ and the Falcon II. This trailer is considered to be the pioneer of positive tracking trailers. The Quad-Steer TRACKER™ is built with high-quality materials and can trace a tow vehicle’s path, allowing it to hug corners and turn around in less space than most trailers. The savings of valuable space make the Quad-Steer TRACKER™ a cost-effective option compared to traditional trailers. The Falcon II is a trailer designed specifically for lean manufacturing environments. The trailer is modular in design with the ability to convert into a conventional caster-steel trailer. By utilizing the same positive tracking design as the Quad-Steer TRACKER™, the Falcon II trailer takes up minimal aisle and floor space. Rivers Metal Products also collaborates with Peregrine, Inc. to develop custom trailers. Trailers can be custom-built with various deck sizes, load capacities, and accessories. Rivers Metal Products provides design assistance and makes recommendations to create solutions that satisfy customer needs. In addition to the trailers, Rivers Metal Products also partners with Peregrine, Inc. to produce racks, shelves, enclosures, and other customized accessories. Quad-Steer material handling equipment is designed to follow a towing vehicle’s precise path, allowing the user to maneuver multiple trailers in limited spaces. Rivers Metal Products and Peregrine, Inc. designs the material handling equipment for durability and reliability in continuous use applications such as manufacturing plants and distribution centers. Peregrine, Inc. trailers are common in automotive, electronics, aerospace, food, metal fabrication, glass, furniture, and health industries. Hospitals, office buildings, theme parks, military facilities and even sports stadiums that use the Quad-Steer TRACKER™. Companies such as Boeing, General Electric, Disney World, FedEx, Ford, and General Motors all have found the Quad-Steer TRACKER™ to be the top trailer to meet their needs. Rivers Metal Products enjoys collaborating with Peregrine, Inc. and exceeding clients’ needs by providing superior quality, innovative design, and unique trailer customization. For more information on Peregrine, Inc. trailers, products, and capabilities, visit peregrine-inc.com or call 402. 466.4011. Celebrating 50+ years as a metal fabricator, Rivers Metal Products is a recognized leader in the design and fabrication of custom metal products across the nation and the world. As an industry pioneer and innovator, Rivers Metal Products provides customized, knowledgeable metal solutions. Adaptability and expertise mean Rivers Metal Products is well positioned to handle the needs of diverse customers across many industries. For more information, visit www.RiversMetal.com.